January was a low month for me too. But most importantly we both are well ahead of last year. Here's to more exciting February! 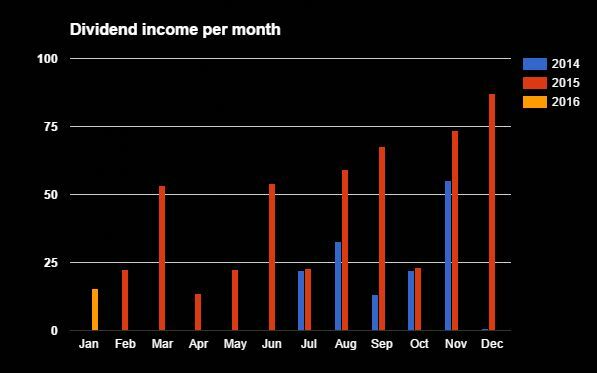 Low month of high month... it's all passive income that will grow over time. Nothing to complain about that :) Of course, getting divvy increases doesn't hurt either. Thanks for sharing. Look forward to your next update. You receive dividends from Total company, but in your portfolio I don't see Total. Can you please update your portfolio. Thanks for your support! I love hearing from fellow investors, who follow the path of DGI. You are right, I'm not posting much at the moment. This has to change, but I was so busy moving the last couple of weeks..
Total is not one of my holdings. With 'Total' I mean the total amount.. $9.20 (from GE) + $6.37 (from WMT) = total of $17.57. You understand? Nice uptrend on that graph DfS! 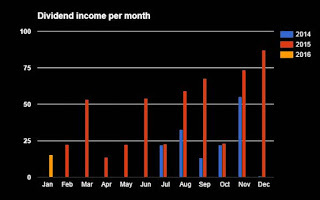 Its fun to compare monthly dividend income across different year in this way -- I use a similar chart.